When properly managed, healthcare waste should not cause any adverse impacts on human health or the environment. By sorting and reducing waste, hospitals not only avoid disposal costs and environmental hazards, but reduce the amount of raw materials, energy and processing needed to replace the products they use. Health facilities can cut waste and greenhouse gas emissions through better purchasing (minimizing packaging, avoiding toxics, choosing reusable products, and buying recycled), recycling (including anesthetic gases), composting and biodigesting, minimizing waste transport (local treatment and disposal), and, of course, choosing their final waste disposal technologies with care. Action on healthcare waste is essential to strengthen the foundations of low carbon health care systems. The majority of healthcare waste is paper or plastic, both of which are highly recyclable. Segregating at source, treating potentially infectious plastic wastes, and recycling conserves resources, and can reduce the carbon emissions of waste management hugely compared to waste incineration. Biodigestion of organic wastes from healthcare systems also reduces carbon emissions. Food and other biodegradable wastes emit methane as they rot. If this happens in a landfill, the methane, which has around 30 times the greenhouse effect of carbon dioxide, will be emitted to the atmosphere. If this waste is instead digested under controlled conditions, the methane can be captured and used as a fuel. Because methane has a stronger greenhouse effect than carbon dioxide, burning it reduces the CO2 emissions of the waste. A variety of non-burn technologies are also available that can safely disinfect or degrade the wastes for landfill disposal. Many disinfection strategies utilise steam, especially autoclaves. Research conducted by HCWH proved that autoclaving waste has CO2 emissions over fifteen times lower than waste incineration. Autoclaves are economical, manufactured in a wide range of options that will suit most situations, and are well understood by healthcare systems, which routinely use them for sterilizing surgical and other medical products. These techniques all help mitigate climate change. 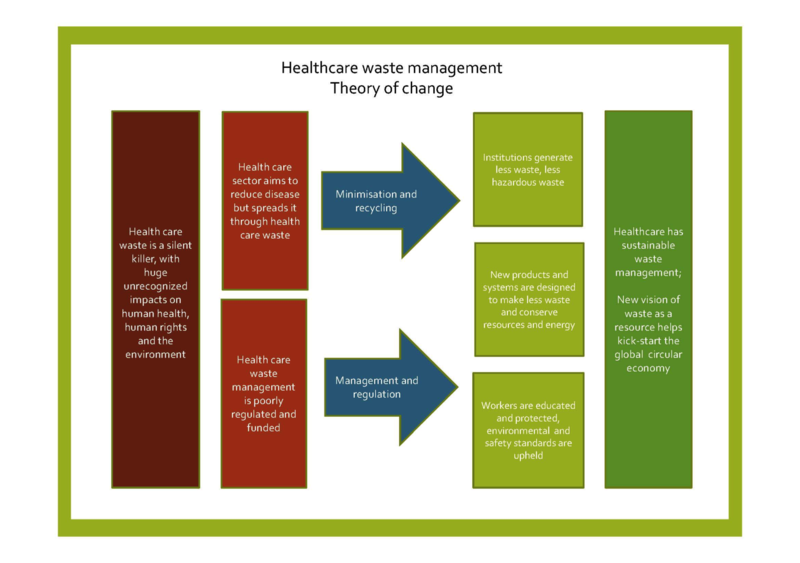 But sustainable healthcare waste management technologies such as biodigestion and autoclaving can also play a role in making healthcare systems more resilient to disasters, of all types, which will be increasingly important in areas that face the greatest threats from climate change. For example, unlike incineration systems, which must be operated continually to minimise toxic emissions, most alternative treatment technologies, such as autoclaves, operate on a batch basis, and usually only during the working day. That means that extra shifts can easily be incorporated into the schedule if necessary to cope with extra waste generated during a crisis. Healthcare needs to leverage its buying power to ensure that the materials it purchases generate as little waste as possible that is toxic, non-recyclable or simply unnecessary. The procurement of safer alternatives causes reduction of pollution and health impacts, along with the environmentally sound management of all waste throughout the product life cycle; promoting waste prevention, reduction, and recycling and reuse. Advocating for the replacement of these products with safer alternatives that have been designed for repair or recycling at the end of their useful lives, the healthcare system can help kick-start the global circular economy. For more information about HCWH other projects on procurement, click here.